Three good minutes is what it took to right the wrongs of the first 57 bumbling minutes at snowy Beaver Stadium yesterday, as the Nittany Lions (8-1, 5-0 Big Ten) eked out a narrow victory over the hapless Fighting Illini (6-3, 2-3 Big Ten), 10-7. This was head coach Joe Paterno’s record setting 409th victory, for the all-time Division I lead. After a boring and scoreless first half in which Penn State’s only threat ended with a failed 43 yard field goal attempt, Illinois put together its touchdown drive halfway through the third quarter with a 10 yard Scheelhaase pass to Spencer Harris. State played from the hole from that point until there was barely more than a minute left in the game. A 30-yard field goal by Anthony Fera after McGloin was sacked by Ming the Mercilus at 7:00 of the fourth cut the deficit to four. Penn State would still need a touchdown to win. The breakthrough came with 3:05 left, when McGloin hit Derek Moye for a 20-yard completion. Wait, who??? Moye was supposed to be out with a broken foot. He was expected to be held back until at least the Nebraska game. However, without fanfare, he suddenly appeared, and McGloin had his favorite target back — a good thing, because substitute go-to guy Justin Brown had been ineffectual. How did Moye get into the game? Whose decision was it? I read a tweet after the game saying that the rumor in the press box was that Moye had “put himself in”. A little thought would have debunked that, as he might have gotten away with one play that way before McQueary called the stadium cops to get him off the field. No, it turned out that the doctors had cleared Moye for use “in an emergency” and Joe Paterno had instructed his brain trust to “tell McQueary to have our best receivers in the game.” Up to that time, McQueary had been keeping Moye warmed up and had warned him that he might be called upon. Moye stayed in the game while McGloin completed two passes to Justin Brown to continue the drive down to the Illinois 36, where Silas Redd ran for four yards. The Lions stalled at the 32 after Moye dropped a McGloin pass on 3rd and 6. Moye felt that he had let the team down; however a dubious pass interference call gave Penn State a first down at the Illini 17. From there, a nine-yard completion to Moye coupled with some nifty running by Redd against Illinois’ goal line defense produced the score. Importantly, with respect to team confidence through the remaining three tough games, McGloin had kept his poise while directing a 10 play, 80 yard drive in the face of a clock winding down and an excellent Illinois defense. 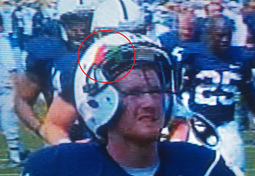 But Penn State had left too much time on the clock, giving the ball back to Illinois with over a minute. Their place kicker, Derek Dimke, had a perfect 7-7 field goal record for this season. A tie seemed likely if the Illini could move the ball into field goal position against a tired Penn State defense. Scheelhaase was able to maneuver the ball down to the Penn State 25 with five seconds left and called timeout so Dimke could set up. We must have temporarily switched to hockey, because Penn State iced the Dimke with another timeout. That plan must have worked. The normally accurate Dimke bonked one off the right upright as time expired. Laces out, mah man! Game over. Penn State wins, 10-7. For all the winter storm warnings, the field was in pretty good shape, and the wind was not a problem. Crappy play just happened to be the modus operandi for both teams. McGloin showed that he could handle pressure with that final drive. Although he is not the fastest quarterback this Turkey has seen, he definitely can use the pocket to advantage, he senses when he is in trouble, he knows when to scramble, and he knows when to get rid of the ball and when to eat it. He also can calmly check down through his options as he is being assailed behind a questionably effective offensive line against a pretty pretty pretty good pass rush by Ming the Mercilus and Company. McGloin had played a complete game at Northwestern and performed well there. He was first off the bus at Beaver Stadium and, as that indicates, started this game. Why, then, did the offensive braniacs replace him with Bolden at the start of the second quarter? For one reason, McGloin stunk up the place in the first quarter, going 4-12 passing. Most probably, the coaches had already decided on this plan before the game and McGloin’s screw-ups validated their decision. However, as bad as McGloin might have been in the first quarter, Bolden was worse in the second. He clearly was shell shocked back there, not feeling imminent pressure and making very shaky decisions. To apply one of the sports announcers’ favorite avian metaphors, his malfeasance, misfeasance, and nonfeasance brought out the boo birds. This is rare for a normally polite and respectful Penn State crowd. But these people had braved adverse weather to sit there and watch Bolden screw up and were not going to do so without making their expletives known. Bolden did not complete a single pass. In one instance he attempted to throw a pass with defenders virtually hanging on his arm and was nearly intercepted. In another, he was sacked but he forgot he could have gotten rid of the ball to save the loss. And finally, after his fourth unsuccessful series, as if to put a capstone on his day and possibly his career, he was tackled for a four-yard loss to the PSU 25 where he fumbled the ball away to the Illini, giving them a gold-plated scoring opportunity. Fortunately, the bumbling tribe of Peorians formerly led by Chief Illiniwek, who has been banished to obscurity by the Political Correctness Department of the NCAA, screwed up the opportunity when Scheelhaase threw a bad ball from the Penn State 9, which was intercepted by Sean Stanley with 24 seconds left in the half. McGloin, not Bolden took the offense onto the field after that to wrap up the crappiest half of football PSU has played this year, and Bolden was not seen or heard from again. In further bird-related news, Twitter was atwitter, replete with tweets from the electronic equivalent of boo birds. Many disgruntled tweeters asked why Bolden got any playing time at all. Many others said that they felt bad for him, but for the team’s sake, he should sit. Let us pray. God, please grant the offensive braniacs and that stubborn old wop boss of theirs the serenity to make the right decision about the quarterbacking debacle, with the understanding that the aforementioned collection of bums will need all Your help to win any of the three remaining games. Lord, give them the courage to face up to those politically correct weenies who would consider selecting the mick kid as a racist decision. Let Thy servants Joseph and Jaysus walk not into the valley of the shadow of death because of their desire to coddle the Bolden youngster, as it were, for if the schvartze kid learneth not how to play under pressure by this juncture of the season, even Thine divine guidance will not help him. This we pray, in Moses’ name. Amen. Yeah, it’s time, folks. Time to step up to the bar, slam our fist down, and demand three fingers of McGloin. (Oops. My metaphor just crossed over into Irish drinking stereotype territory. Oops.) The sparse, weather beaten demi-crowd at Beaver Stadium yesterday had it right. This team is not going to win with Bolden. Period. Forget about the crap you hear from Paterno about Bolden and McGloin bringing different skill sets. Bolden’s greatest skill seems to be hanging around after having been written off by everybody but the politically correct coaches. Please end the experiment before putting the team in a position to lose the next three crucial games. With McGloin at the helm, there is some small chance that Penn State, currently unbeaten in the Big Ten (no thanks to Bolden), can actually make it to Lucas Oil Stadium for the conference championship game. To continue the Bolden experiment at this point would be insane! Was it Einstein who said that repeating the same thing over and over while expecting different outcomes each time was the definition of insanity? Back to this forgettable game, one thing worth remembering was the performance of Silas Redd, who accounted for 137 of Penn State’s anemic total of 209 net yards total offense. This kid is a star. I’d worry about him being snatched up by the NFL before his senior year. I think he’s that good. Just consider the inept offensive line he’s been forced to play behind. He makes them look like they’re for real. The passing offense sucked, as the two-headed quarterback combined for 9-28 passing for a measly 98 yards (Bolden accounted for 0-4 of that). The leading receiver was Justin Brown with three catches for 50 yards. Derek Moye, who played only the final three minutes had two receptions for 29 yards. Illinois outgained PSU 286 to 209, had 16 first downs to Penn State’s 14, and dominated time of possession 32:51 to 27:09. But they also were penalized for 50 yards and turned the ball over four times to Penn State’s three, and of course, their normally highly reliable field goal kicker let them down. This is their third straight loss. Joe listened to me, keeping the reverse end-around in the “not used” section of the game plan. Although the slow-developing play is a major gamble under perfect conditions, on this field it would fail ten times out of nine. This Turkey gave you the betting edge this, although my prediction called for a couple more touchdowns. If you had put your money where my mind was, you would have won both bets. Once again, Penn State failed to cover the spread, and the points total was wayyyyy under the over/under of 38.5. Next weekend will be our bye week, followed by a bone crushing final three games against Nebraska, Ohio State, and Wisconsin, the latter two being played on the road. Several things need to be fixed before the ‘Huskers step onto the field a week from Saturday. One of them is obviously the final decision on the quarterback mess. I’ll be back with a preview of the big Nebraska game sometime in the next two weeks, but I’ll also try to give you some non-game directed Turkey wisdom in the interim. OK, and in case you forgot about the trivia question, it was Chester A. Riley who lived at 1313 Blueview Terrace.